What’s better than a destination Outer Banks wedding? A New Year’s Eve Outer Banks wedding! That’s exactly what Natalie & Grant – who are actually OBX locals who buy, sell, build and flip homes as contractor & realtor – decided to do! ! For most of their guests though, the wedding was a destination wedding and a fun way to celebrate one of the best holidays. The wedding party rented a couple of homes in the Pirate’s Cove marina area and that’s where everyone got ready for the festivities. Natalie & her ladies had hair done by First Look Salon and their makeup done by Beauty by Tiffany. Once ready, due to the early sunset time in the winter, Natalie & Grant had a first look and took wedding party photos at the gorgeous First Colony Inn in Nags Head! They chose the Pavilion at Pirate’s Cove for the ceremony & reception because it’s one of the largest on the beach! They were able to have both ceremony AND reception setup simultaneously for about 150 guests in this space! To make this happen but still keep it feeling cozy & intimate – necessary for a winter wedding, right? – they draped off part of the pavilion so that the ceremony area was it’s own space and the reception was on the other side of the curtains. It also created a clean backdrop for everything! Heather Events took care of the draping and all the floral and décor for the wedding, except for a few ceremony details. 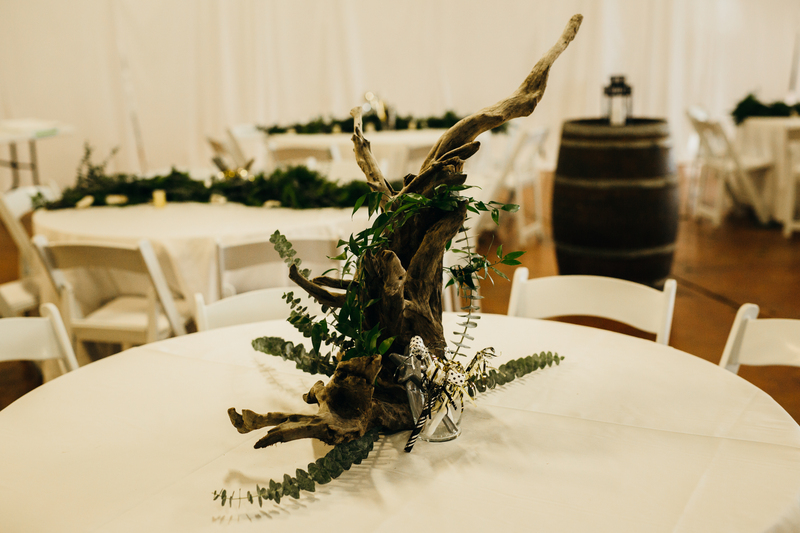 The arch & trees used to accent the ceremony space were actually DIY from the clients and there’s a sweet backstory – the wood used for the arch is from the one of their lots of land they cleared together. Natalie’s stepdad Bill officiated the wedding! Décor was kept in the greenery family with a winter flair and of course metallic and holiday accents to pay homage to the New Year’s Eve celebration. Rentals like the farm tables, rustic chairs and wine barrels were from Ocean Atlantic Event Rentals. Jeremy Russell of Outer Banks Wedding Entertainment provided acoustic music and DJing for ceremony & reception, including a midnight countdown! Mulligan’s had their food truck onsite and catered the most fun feast! Natalie & Grant decided on a station and hors d’oeuvres menu and since the party was going to go all the way to midnight, we staggered the food service so everyone had food to enjoy all night long in between dance breaks! Some of my favorites? The mac & cheese cups (the BOMB!) and the tacos! The bartenders served up beer via Brew Dolly kegs, wine & some delicious specialty cocktails. For guests wanting a warmer beverage, we had a hot cocoa bar setup! The bride Natalie’s cousin Helena is a professional baker in Virginia who owns All Bent out of Cake and she provided the amazing wedding cake for the newlyweds. My favorite part of the wedding? The Midnight Exit of course! Just before midnight we had all the guests lined up to form a tunnel for the newlyweds to exit through! We all did the 10-9-8… countdown and then at midnight let off confetti cannons as Natalie & Grant ran through! I love confetti so this was a dream come true! Definitely one of my favorite wedding moments! Transportation by OBX Bride Ride was available for the wedding party and also for guests for a safe ride home. Sarah D’Ambra Photography captured this New Year’s Eve destination wedding celebration and I know you’ll love the images below! Loved this Pirate’s Cove Wedding? Here are more you may also like!